Advertising on Facebook is hugely popular. Between 2013 and 2014 there was a 61% increase in take-up of Facebook adverts. In the first quarter of 2015 there was further 42% rise. 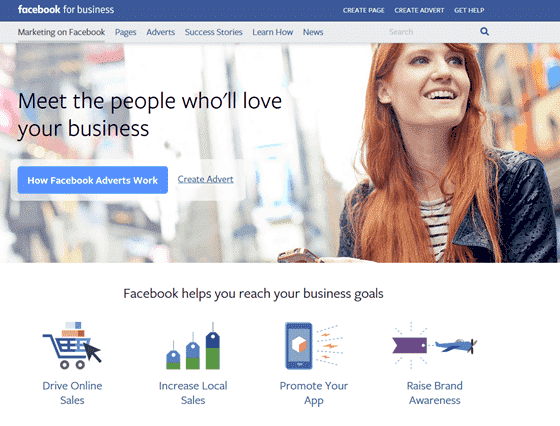 In the past 12 months, advertisers have spent over $40 billion on advertising with Facebook. Meanwhile, growth in advertising on Google is a comparative low 12%. It appears that advertisers are favouring Facebook ads. It is not difficult to see why. Google advertising allows you to target keywords that people type in. You can exert some geographical control so that your advertisement only appears to people within your local business area. But you cannot do much more than that. Meanwhile, over at Facebook, you can much more precisely target your advertising to more specific geographical areas, as well as age groups, gender and specific personal interests. Consequently, Facebook advertising means you can get your advert where it is more likely to have an effect. Businesses that advertise on Facebook and who know the system well and use it effectively report a good degree of success. Indeed, an analysis of companies that between them spend $6bn on Facebook adverts shows that Google is less effective in gaining click-throughs most of the time. This is in spite of the fact that the vast majority of Facebook advertising clicks come from desktop computers, whilst most Facebook activity itself is on mobiles. In other words, most Facebook users are not clicking on an advert. Advertisers, of course, know that the click through rates are going to be low. Few of us are that bothered or interested in advertising. However, is it possible that Facebook is making potential advertisers think that the system is better than it is? That is the subject of an article in the October edition of PC Pro Magazine. This reveals that one advertiser was told that in the selected area for which they were targeting their adverts there were 620,000 Facebook users. That is rather hard to understand, given the entire population of the region is only 232,000 individuals. After complaining, Facebook agreed there was some kind of problem and revised the potential reach of the proposed advert to 80,000. Hugely different to the original. So I decided to put this to the test. I live in an area which has a total population of 1,015 people. That is the entire Parish population; the parish itself is 13.4 square kilometres. I decided to set up a Facebook advert for just one kilometre of this parish. According to Facebook, my advert will reach 2,500 people – more than double the population of the entire area, much of which is elderly and less likely to be using Facebook anyway. These are only anecdotal reports, I know, but experienced digital marketers point out that you need to do your research first, understand the actual size of your target population and take the Facebook information with a pinch of salt. After all, Facebook itself does say it is only an “estimate”. It appears, though, that their powers of estimation are not that good. What this means in reality is that people could be fooled into believing that their advertising will be more effective than is actually possible. And it is not just Facebook that seems to do this. When I tried to set up an advert on Google, it told me that there were 22,000 people who would be searching within my parish. That’s 20 times the actual population…! What’s the moral in this? Don’t believe what online advertising systems tell you about the potential for your adverts. Do your own research and work it out yourself.